Pipe Straps Are Used For Various Pipe Or Tubing Structural Support Or Securing Applications. Pipe Straps are made of Copper, Stainless Steel or Galvanized Steel for long lasting durability and dependability. Attach directly to vertical or horizontal piping or tubing to provide secure, structural support. Wide range of 1 or 2 hole type straps are available for use with 1/4 to 4 inch diameter pipe sizes. 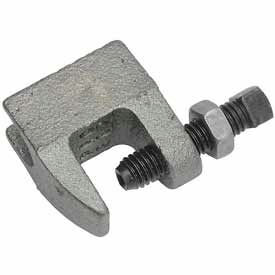 Top Beam Clamps Are Used For Attaching Hanger Rods. 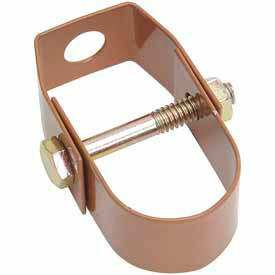 Top Beam Clamps are designed to attach hanger rods to the top flange of beams or bar joists. Beam clamp models are made of ductile iron, galvanized ductile iron or stainless steel and are able to handle max pipe sizes of 4, 5 or 6 inches. The clamps vary in size and can handle maximum loads of 250, 350, 400, 470, 500, 550, 700 or 850 lbs. Perforated Hanger Strapping Is Used For Various Pipe Or Tubing Structural Support Or Securing Applications. 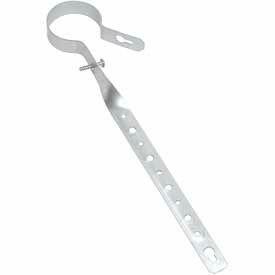 Perforated Hanger Strapping is made of Stainless Steel, Galvanized Steel or Pre-Copper Plated construction for long lasting durability and dependability. Provides secure, structural support for light duty piping or tubing applications. 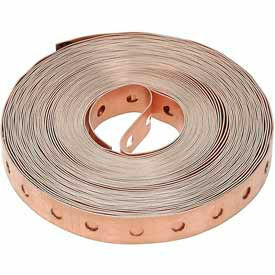 3/4 inch width strapping is available in 18, 22, 24 or 28 gauge thicknesses. 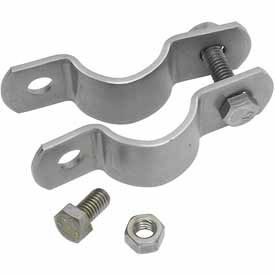 C-Clamps Securely Attach Hanger Rods To The Bottom Flange Of Beams. C-Clamps are solidly made of Carbon Steel, Ductile Iron, MalIeable Iron and Stainless Steel for solid, long lasting durability. Available to fit 4", 5' and 6" maximum pipe size and 400 to 630 lb. maximum load. Ribbed design for added strength. Hardened steel cup point set screw secures clamp to beam. 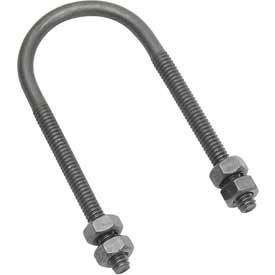 Clevis Hangers Are Designed For The Suspension Of Non-Insulated, Stationary Pipe Lines. 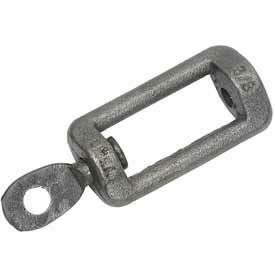 Clevis Hangers come in a variety of styles for increased versatility. Upper locknut must be tightened securely to assure proper hanger performance. Choose from Carbon Steel, Copper Epoxy Coated Carbon Steel, Galvanized Carbon Steel and Stainless Steel models. Sizes and max loads vary. Riser Clamps Support Vertical Pipe Runs In A Variety Of Sizes For Residential, Commercial And Industrial Infrastructure. Riser Clamps support and stabilize long vertical pipe runs for long lasting durability. They use standard hex bolts and nuts. Riser Clamp sizes vary per model. They come in four different materials. Carbon Steel Riser Clamps are useful for all basic interior commercial and residential applications. Copper-Gard Copper Epoxy Coated Steel Riser Clamps feature corrosion protection and are mostly used in interior industrial applications. Galvanized Carbon Steel Riser Clamps are used for exterior industrial applications due to their rugged, weatherproof nature. Stainless Steel Riser Clamps are primarily used in residential and commercial environments where cleanliness and aesthetic polish are of greater importance. Maximum weight load for each riser clamp is between 220 lbs. and 1,500 lbs. depending on pipe size. Side Beam ConnectorsSide Beam Connectors Are Designed For Mounting to Sides of Wood Beams Using Drive Screws. U-Bolts Have Load Capacities Up To 5,430 Pounds. 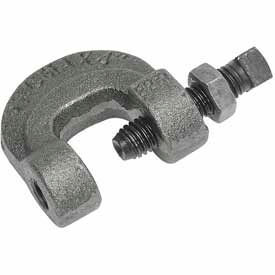 U-Bolts are engineered for support and to guide heavy loads. The bolts are available in carbon steel, galvanized carbon steel and stainless steel for long lasting durability and reliability. 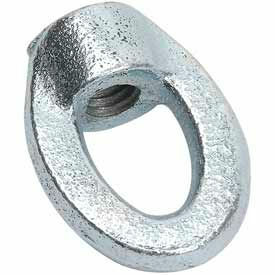 U-bolts are made to work with pipe sizes of 1/2" to 10". They can handle maximums loads of 485, 1,220, 2,260, 3,620 or 5,420 lbs. The sizes and weights of the bolts vary. 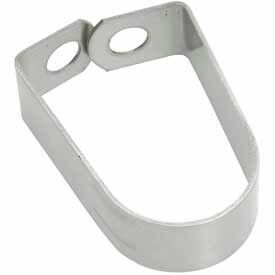 SPLIT RING IMP S/S 3/4"
SPLIT RING EXTENSION HANGER - STAINLESS STEEL, Designed for the suspension of non-insulated stationary pipe lines, horizontally or vertically. Stainless steel is recommended for applications where protection from corrosive environments is needed. 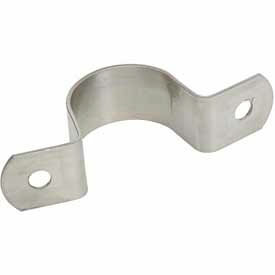 Designed for the support of conduit, cable or pipe on walls or sides of beams. Not recommended for horizontal use on ceilings or bottom of beams. Designed for the suspension of non-insulated, stationary copper lines. 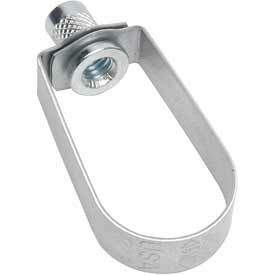 Stainless Steel Band Hangers Are Designed For The Suspension Of Non-Insulated Stationary Pipe Lines. The Hanger Flange Plate Is The Used Solution For Attaching Hanger Rods For Commercial, Residential And Industrial Applications. The Hanger Flange Plate is available in four separate materials and two different sizes. 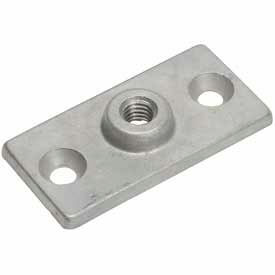 All hanger flange plates can be attached to wood beams, sheet metal, plaster and other materials. They require a #12 size screw for plate attachment. Sizes vary per model. The malleable iron plates are useful for indoor commercial and industrial applications. The copper epoxy coated malleable iron plates utilize CopperGard epoxy coating for increased corrosion protection. The galvanized malleable iron hanger plates offer weatherproof solutions for long lasting durability. The stainless steel hanger plates are easily cleaned and provide a polished aesthetic for residential and commercial use. 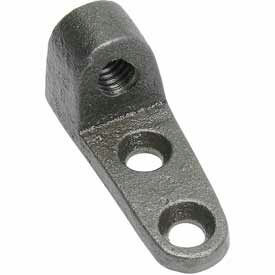 Malleable Iron Eye Sockets Attach Hanger Rods To A Variety Of Hanger Types For Industrial And Commercial Use. 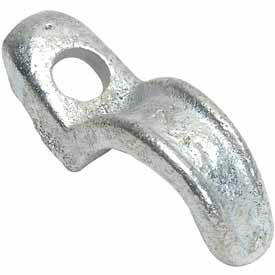 Malleable Iron Eye Sockets utilize rugged iron manufacturing techniques for long lasting durability. They contain pre-drilled screw channels. Pipes may be threaded through the eye sockets. Sizes and weight limits vary per model. All Malleable Iron Eye Sockets are Silver in color. 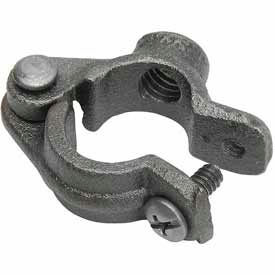 Galvanized Carbon Steel Rod Couplings Are Used For Connecting Rods. Galvanized Carbon Steel Rod Couplings are engineered for connecting two lengths of rod with equal diameters. The couplings come in various sizes. Rod Couplings are available with load capacities of 230, 610, 1,130 and 1,810 lbs. 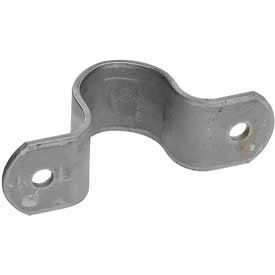 Angle Brackets Are Used For Attaching Hanger Rods. 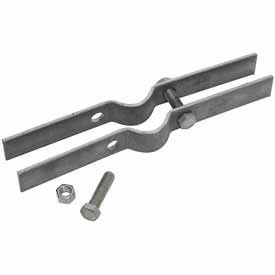 Angled Brackets are used for attaching hanger rods to the sides of beams or walls. 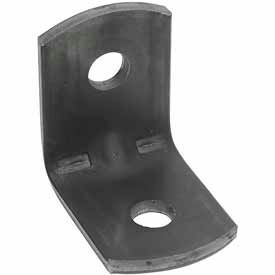 The brackets are made of carbon steel or galvanized carbon steel for long lasting durability and reliability. They are available in various hole sizes and have maximum loads capacities between 300 and 900 lbs. 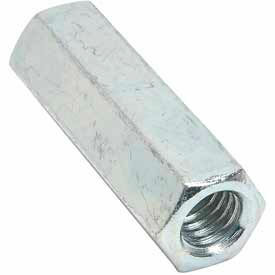 Hangar Bolts Are Designed For Suspending Pipe Supports From Wood Structures. TURNBUCKLE ADJUSTER - Designed to provide vertical rod adjustment with split ring hangers. Short Clips Are Designed To Support Pipe. 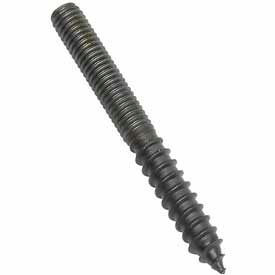 Short Clips are engineered to support pipe that is close to the ceiling or a wall. The clips are available in carbon steel and galvanized carbon steel. They are available in various sizes to handle pipe sizes from 1/2" to 4". The maximum recommended load capacities for the clips are 300 and 400 lbs. Pipe Clamps Are Designed For The Suspension Of Cold Pipe Lines And Hot Pipe Lines Where No Insulation Is Required. Copper Gard Adjustable Swivel Ring Hangers Are Designed For The Suspension Of Non-Insulated Stationary Copper Lines. Designed for the support of PVC or ABS DWV pipe from wood joists. Evenly spaced holes allow for proper pipe pitch. 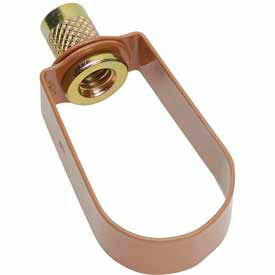 Copper plated DWV hangers are NOT designed for copper DWV pipe.